When developing a new cell based assay it is important to establish that cells are able to survive under experimental conditions. There are a number of different assays that are designed for specific cell types and can detect the health condition of the cells. Different tests are also able to differentiate apoptosis from necrosis which may offer important information about off-target signaling. We work with a number of different human cell lines that are both adherent and free-floating. Our cell biologists have a variety of cells to work with and are excited to expand our cell bank to fit your research needs. If you are not sure which cell lines may be the best model organism we can work with you to select the most popular cell line for your research. This graph depicts the linear correlation between fluorescence and the number of cells. 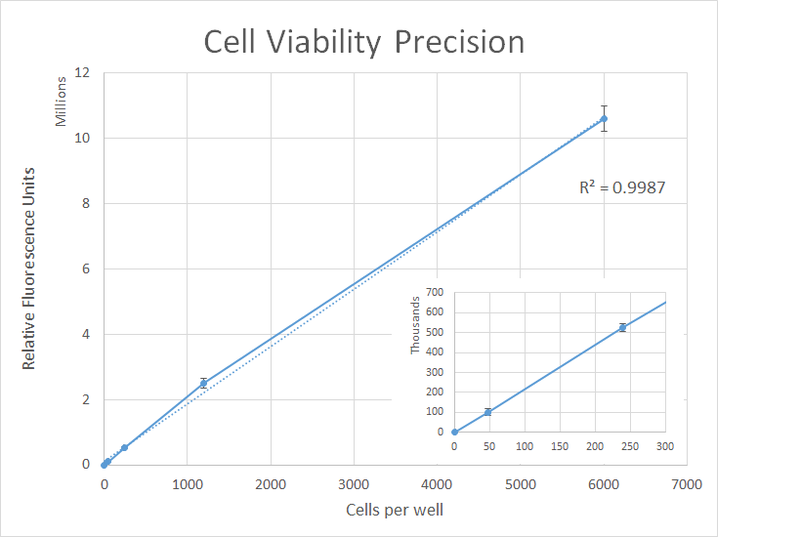 The CellTiter-Glo (Promega) Viability Assay was able to detect as few as 48 cells. These types of assays are carried out in 384 well plates and can be done in a number of different cell lines.